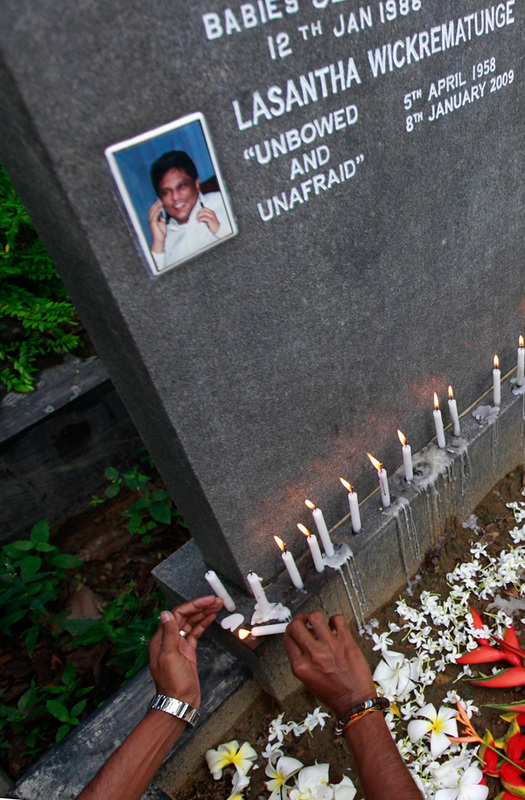 Under tight security, the remains of Sunday Leader Founder Editor Lasantha Wickrematunge was exhumed today at the Borella general cemetery. The remains were exhumed as part of a fresh investigation to verify the actual reason behind his death. The order to exhume his remains was issued by the Mount Lavinia Magistrate on September 8, following a request by the CID. The remains were taken out of the Borella cemetery for a fresh autopsy to be carried out by the Colombo Judicial Medical Officer. However, the exhuming process was halted temporarily in the morning after a drone camera flew over the grave site, attempting to video the exhumation. The media was barred from covering the event following a request from Wickrematunge’s family. According to the CID, there were inconsistencies in the original report released by the then Judicial Medical Officer over Wickrematunge’s death. 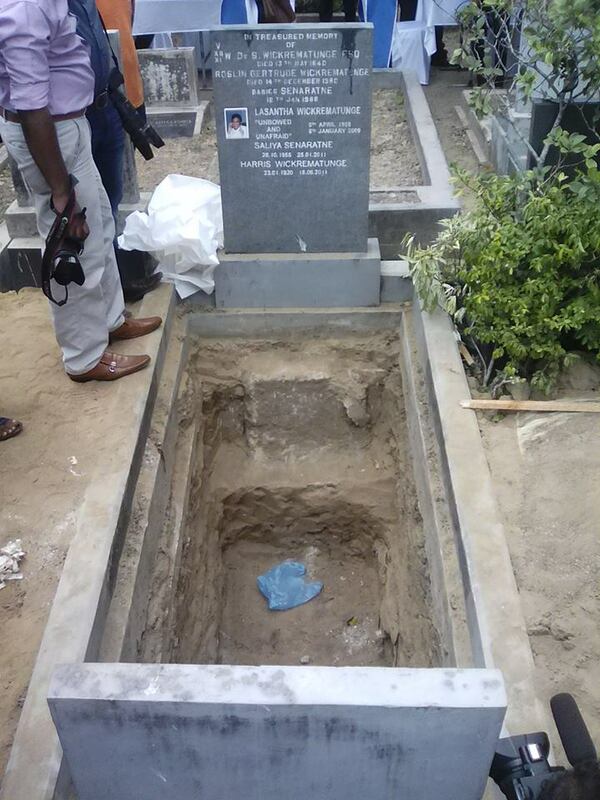 Since the court issued the order to exhume the remains of the slain editor, the grave side of Wickrematunge has been under heavy police protection. Wickrematunge was murdered while he was on his way to work in January 2009 in Attidiya. A military intelligence officer is currently in remand for his alleged connection to the assassination. First MaRa MaRa vhaTu <MaRa AmaNa maRa miNi MaRu MaRa DhushaNa MaTRa and his gang kills them. After they are DEAD Yahapalanaya carries out a Soap Opera show, and do not even let the Dead are allowed to rest in rest in Peace while the killers roam freely and Attend Weddings of Yahapalanaya. This is Para-Sinhala PaRr-Buddhist Culture in the Land of Native Veddah Aethho, the so-called 2.500 year Para-civilization. Was the initial autopsy on Lasantha Wickrematunga also done by the same corrupt Dr. Ananda Samarasekera, the former JMO of Colombo who did the autopsy on Rugby player Wasim Thajudeen? There was strong evidence as detailed in the Sunday Leader, that Lasantha Wickrematunga was assassinated NOT with a bullet but by a BOLT GUN, which is usually used to kill pigs in most western countries. A picture of such a gun was carried in the Sunday Leader at that time.It showed two nail type protrusions on a wooden pole which when activated close to the back of the head pierces the scull instantly killing the pig or victim in this Lasantha Wickrematunga. The JMO is supposed to have concluded that death was due to a bullet wound in contradiction to the other reports. Time for “KARMA” to turn wheels and for Justice to prevail. Lasantha was a very respected journalist and he was killed in broad daylight which was the way our thrice blessed country was being ruled during the Rajapakse regime. It is all Sri Lankans wish that the perpetrators of this dastardly crime are brought to book and punished. The high flying Duminda Silva, appointed Monitoring MP, to the Defense Ministry is today a convicted murderer, and there are many more murderers loitering around, “KARMA” will catch up with them too, soon, which is why the so called Joint Opposition is making such a big hue and cry when they are being hauled before the law, for all the corrupt activities they did during the last regime. Did it say a bolt gun used to kill pigs? are yamapalakayas fed up with thajudeen? i think an election is just around the corner ! How did you manage to get few lines posted here on CT without “Edited” being sign posted under your name? Since journalism has gone to the Canines Canines have a great future in journalism in this country. Gota the psychopath serial killer must be shitting in his pants. I cannot see him shitting in his pants while rubbing shoulders with the Prez at the VIP wedding table. How many more corpses to be exhumed. ????? The world know the actual reason why he was killed and exhume the body for what reason?? Will there be any real investigation or just another Thajudeen case?? We are fools to vote for these cunts!!!!!! Be patient, he will confess when the rope tigtens around his neck. “we have consistently espoused the view that while separatist terrorism must be eradicated, it is more important to address the root causes of terrorism, and urged government to view Sri Lanka’s ethnic strife in the context of history and not through the telescope of terrorism. We have also agitated against state terrorism in the so-called war against terror, and made no secret of our horror that Sri Lanka is the only country in the world routinely to bomb its own citizens. For these views we have been labeled traitors, and if this be treachery, we wear that label proudly. … The LTTE are among the most ruthless and bloodthirsty organizations ever to have infested the planet. There is no gainsaying that it must be eradicated. But to do so by violating the rights of Tamil citizens, bombing and shooting them mercilessly, is not only wrong but shames the Sinhalese, whose claim to be custodians of the dhamma is forever called into question by this savagery, much of which is unknown to the public because of censorship. I would add that anybody outside the necessary administrative/medical staff would be voyeurs. Public interest only kicks in when (and after) the report is published. It is right and proper that family wishes are respected. IF the drone was launched by Hiru news, then that is entirely in their character. Shame on their thick-skins. AND one final thought, IF the principle of exhumation is extended to the ordinary man WE will have many thousands of bodies needing to be exhumed to establish the truth.